Capturing the Photo Ark: A behind the scenes look at wildlife photography | Dallas ZooHoo! 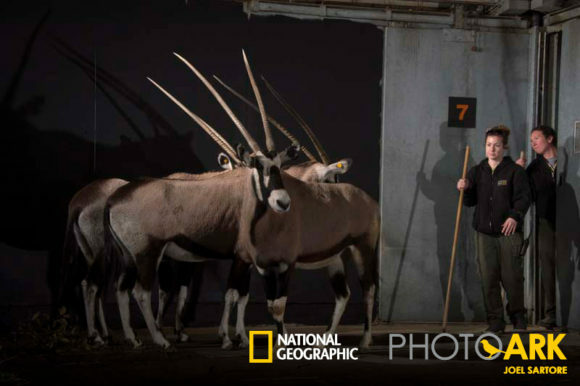 Joel Sartore photographs Anita, Mara, and Nande, three Gemsbok (Oryx gazella) females at the Dallas Zoo. Ever photographed a 12,000-pound African elephant or an Orinoco crocodile with 68 teeth? It’s not as easy as it sounds, if it sounds easy at all. These are just a few of the common problems faced by photographer Joel Sartore as he captured more than 6,000 images of wildlife for the National Geographic Photo Ark exhibition. 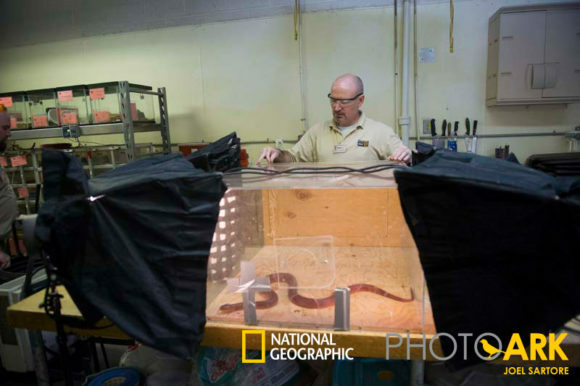 Assistant Supervisor of Reptiles and Amphibians Matt Vaughan helps set up a shoot with a red spitting cobra (Naja pallida). Sartore’s goal is to photograph every species currently in human care — that’s more than 12,000 different species. For many of the animals featured in Sartore’s portraits, time is running out. An alarming number of these species are already classified as endangered and face the possibility of extinction. Through the captivating images of the Photo Ark, Sartore hopes to inspire people to help protect these animals and #SaveTogether before it’s too late. The Dallas Zoo is presently one of only three zoos in the nation to showcase the Photo Ark. The exhibition, which can be found throughout the Zoo, boasts more than 80 images of Joel’s most compelling work — many of which feature our very own Dallas Zoo animals. But capturing these portraits involved much more than a couple of quick flashes of the camera. Cathy Burkey, Dallas Zoo’s staff photographer, served as Sartore’s production and photo assistant, as well as a Zoo ambassador during the project. Burkey and Sartore first began working together in the winter of 2014. Yet, with more than 15 years of experience as the Zoo’s eyes, Burkey knew that no two shoots would likely be the same. 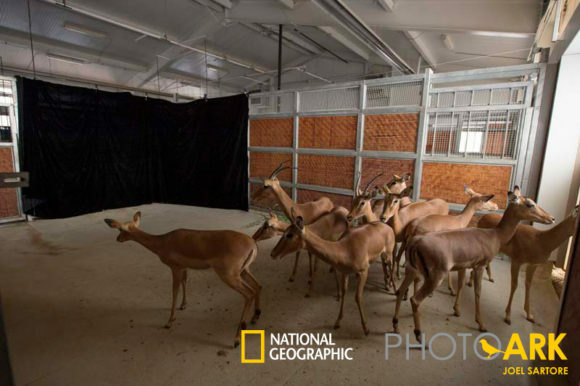 A herd of impala (Aepyceros melampus) stand together, leery of the black photo background used by Sartore. “Being with Joel was a treat since he’s a National Geographic photographer. I watched and learned how he approached photographing Zoo animals—his techniques were foolproof. He respected the keepers’ direction and never went beyond what they were allowing him to do. I don’t think there’s such a thing as an ‘average’ shoot. Every animal has its own personality, therefore, each animal was approached as an individual and with the utmost respect,” said Burkey. Burkey recalled a particularly interesting shoot involving Dara, an older female yellow-backed duiker. Duikers are a type of forest-dwelling antelope threatened by deforestation and hunting. The word duiker means “diver” in South African Dutch, referring to the species’ habit of plunging through bushes when pursued. “We never dreamed that Dara would dive over Joel’s head as he was squatted with his camera taking photos, but she did!” said Burkey. 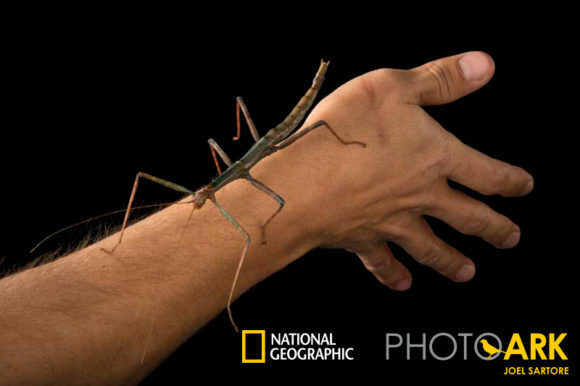 A Texas giant walkingstick (Megaphasma dentricus) crawls along a keeper’s arm. It’s almost always guaranteed to be an interesting day at the office if you’re photographing wildlife. Burkey noted that animal cooperation during the project tended to vary by species, meaning that some shoots were more involved than others. “The most cooperative animals were the birds. Joel had a wonderful light-weight box covered with sail cloth that the birds would sit inside. It worked like a charm! But the most difficult were the impala. They can jump 10 feet straight in the air if they’re startled, so we were very cautious about the number of people present while Joel photographed them. It was a tricky shoot,” Burkey explained. Guests can enjoy the Photo Ark as part of their general admission ticket through Sept. 4, thanks to supporting sponsorship from the Dallas Tourism Public Improvement District and underwriting support from Karen and Phil Drayer and Ruth O Mutch.